The University of Oklahoma's One University Digital Initiative is a technology strategy for a broad, sweeping campaign to ensure the university will take its place in the digital realm. Some universities announce campuswide technology initiatives with great fanfare, only to see enthusiasm fizzle after a few early successes. So when administrators at the University of Oklahoma embarked on the One University Digital Initiative — a broad, sweeping campaign to ensure the institution will take its place in the digital realm — they were determined to sustain its momentum for the long term. "Obviously it's a challenge get an institution this large excited about a campuswide project," said Nicholas Hathaway, OU's vice president of executive affairs and administrative affairs. "We started with the people most excited about the idea, and as word has spread we have increased the size of the group that is the steering committee, so now there is a group touching a large part of the campus that is meeting on a regular basis to sustain the momentum of the effort." The steering committee does not have a formal membership like a typical university council or committee with three-year terms, Hathaway explained. "We chose people who were interested, engaged and capable of having influence on campus first. As additional people with the same characteristics come to our attention, we add them to the group." Janux, a new interactive learning community created in partnership between OU and technology vendor NextThought. Janux is a form of open courseware, combining multimedia-rich content with interactive social tools and a broader learning community. Janux is not a MOOC, stressed Kyle Harper, university provost; it is focused on courses for credit for OU students. "But there are reasons it is valuable to have open content, so anybody can access most of the course material," he added. For instance, a course on the chemistry of beer went viral and got lots of real-world, practical input from craft brewers. OpenStax, an open educational resource textbook partner. A sociology textbook used on campus has saved students more than $150 in the course. "We like the way they produce engaging digital textbook materials curated by faculty," Hathaway said. "We are trying to stay as strongly linked with them as we can, and will look to use their material in other disciplines as they become available." iPad programs in the College of Education, College of Journalism & Mass Communication, College of International Studies and College of Law, along with an OU app designed by Okapi Studio. The university partnered with Apple on iTunes U strategic planning as well as professional development to help faculty and staff create iBooks. Hathaway called the relationship with Apple "foundational to our digital initiative." In fact, the term "digital initiative" came from Apple's lexicon and OU adapted it. "They bring in dynamic people who have been a strong value-add. ITUnes U was our earliest foray into online learning, but iBooks are become even more important." "The fundamental ingredient in all of these projects is thinking about how to let technology do what technology is good at," said Harper. "We have to understand our mission and the kind of university we are – fundamentally place-based. But where does technology fit into that? It isn't some extraneous magic element. It is a tool. Figuring out how it fits into our institutional mission has been the most important element of our digital initiative." Answering that question means involving many types of stakeholders in the visioning process, Harper added. "It was not just presenting a committee with a set of decisions that have to be made, but involving people across a wide part of the campus at different levels — faculty, deans, administrators and staff. Another important aspect is communication. You generate excitement by telling the story well." 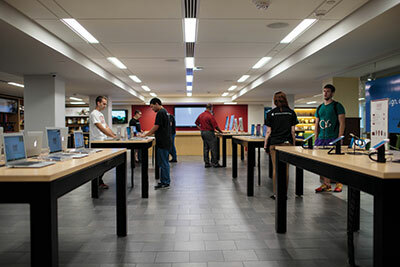 To keep enthusiasm for the initiative going strong, the university conveted its bookstore into a One University showcase based loosely on the idea of an Apple Store. "We wanted to draw students into this space with things that are new, fun and exciting that they can interact with," Hathaway explained. Those elements include Google Liquid Galaxy, an immersive Google Earth experience (built by Delcom), and Makerbot 3D printing. "We also are using it as a space to call attention to the breadth of the digital initiative," he added. Various displays in the store showcase demos of the Janux classes as well as digital books. In addition, Camp Pixel created several One University animated videos, and Route 92 Consulting helped guide the planning in many of the One University projects. While these elements help generate buzz, the initiative has potential to address some of the challenges facing higher education in a concrete way, Hathaway noted, particularly associated with lowering costs for students. For example, perhaps the lowest-hanging fruit involves having faculty promote the adoption of low-cost digital learning materials or creating their own. "We have experienced quite a lot of success there," Hathaway said. "As we started the digital initiative, the annual cost for students for textbooks was estimated at $1,200 per year; that cost has been lowered by $528 per student per year. The digital initiative has played a big role in that. When you calculate that across our whole student body, it is an enormous savings for our students." Hathaway sees the next phase of the digital initiative tapping into smarter uses of data the university already has to help make students' lives easier. "Why can't we analyze data we have to make recommendations about classes the way Netflix does about movies? We have so much information about students and about scholarships, why can't we push that information to them? Those are the kinds of things that are not very common in higher education that I am excited about working on."